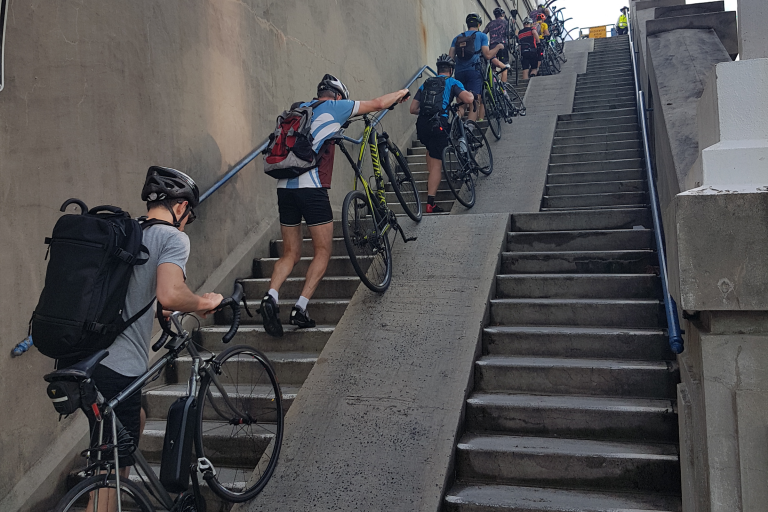 Bicycle NSW has advocated for ramp access to the Northern end of the Sydney Harbour Bridge to improve access for all bike riders. The 2017 proposed preferred ramp option involving an off-set cycleway and the retention of the steps would have been ideal. Unfortunately this was delayed in favour of a handful of local objectors. Over 2000 people each day continue to scale the current steps, whilst children, elders and less-able riders are denied access this cycleway. The Across the Bridge magazine said that the NSW Government is now considering “…lifts and travelators...”. Unlike the one-off expense of building a ramp, lifts and travelators require ongoing, expensive maintenance and break down frequently. This is not a good value solution, for NSW taxpayers or residents of North Sydney impacted by traffic and public transport congestion. Bicycle NSW has encouraged people living in North Sydney to catch up with their elected councillors to talk about the proposed options. We have drafted a letter you can send or email them as well. “If you live in North Sydney we encourage you to get in touch with your local representative on Council to talk about the new options available,” said General Manager of Public Affairs, Bastien Wallace. “If you secure a meeting, we can connect you to a member of RMS staff who can explain the details of proposed options at that meeting,” said Bastien.